Aircraft Spruce works hard to bring you the lowest prices on aviation products. If you have found a better price for an item at another authorized dealer, we will do everything possible to beat that price. Our Lowest Price Guarantee is only applicable to identical conditions of sale. The item must be in stock at the other authorized dealer (not a floor sample, "open box" item, refurbished or demo piece). This offer applies to new purchases only. For price adjustments on existing orders, please fill out the below form and click submit. 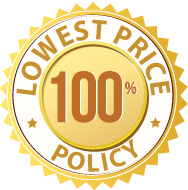 You will find a lowest price guarantee link at the bottom of each product page.